Radio control aircraft come in all shapes and forms, and an rc autogyro is a type of aircraft that, you could say, is somewhere halfway between a plane and a helicopter. Autogyros, sometimes also called gyrocopters, use an engine and propeller to give the forward thrust, just as an airplane does, but the lift comes from a set of freewheeling main rotor blades. The rotors are similar to those found on a helicopter, but they are driven only by the wind flowing through them - they are not powered. The first full size autogyro was developed and flown by a Spanish engineer, Juan de la Cierva, with the maiden flight taking place in 1923. The Cierva autogyro is now a classic design, and autogyro ownership has become a popular sector of private aviation. RC autogyros are, generally speaking, uncommon. There have been very few kits produced and so most radio controlled 'gyros have been scratch built, with the exception of a small number of ARFs. But in 2012 Durafly launched the first plug-and-play foam electric rc autogyro, the Auto-G, since updated to the Super-G Autogyro. The Auto-G (pictured above) is a simple design - foam fuselage and tail feathers with a carbon tube tail boom. The rotor mast is plywood and the main blades are laminated foam. Power comes from a brushless motor turning a three blade prop. A 3S 1300mAh Li-Po pack is recommended and the ESC is 20A. 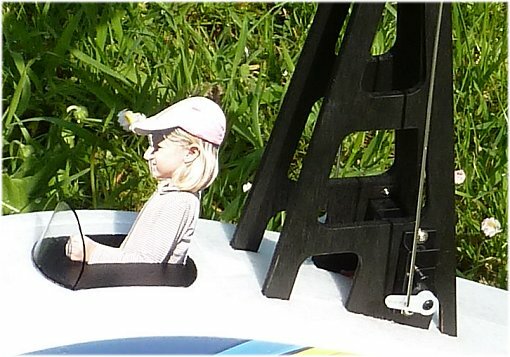 And as you can see in the photo below, I personalised my Auto-G by making a little profile pilot of my daughter, sitting behind a small windshield. I also painted the rotor mast black, which improves the look of the autogyro by 100%! Control of an rc autogyro comes from four channels; motor power, left/right aileron, elevator and rudder. Strictly speaking, the use of the word aileron is, of course, incorrect because there are no ailerons. 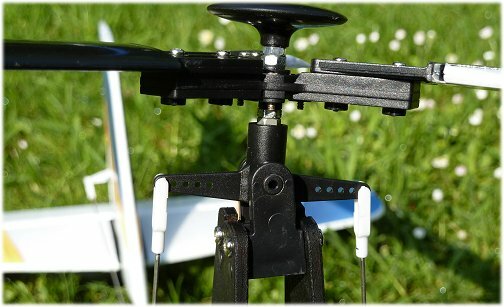 The left/right roll is achieved by tilting the main rotors to one side or the other, this being done by two servos at the base of the rotor mast operating a tilting rotor base assembly. It's all very straightforward stuff and there is very little to go wrong, compared to a complicated rotor head of a collective pitch rc helicopter. Above: the rotor assembly base is simple but effective. The rotor mast of an rc autogyro is angled back at quite an angle, this is to ensure that the blades can quickly get up to speed as the autogyro takes off - if the rotor disc Angle of Attack was flatter, the rotors would struggle to turn as easily. On that note, take off is the most hair-raising part of the flight; the rotors need to be spinning before the start of the take off run, this is easily achieved by spinning them with your hand. Or, if there is a breeze blowing, just point the autogyro in to wind (as it should be for a take off, anyway) and let the wind get the blades spinning. Actually, the Mark II Auto-G's and the Super-G autogyros are fitted with small electric start-up systems, which power up the main rotor blades before the take off roll. This works well, and I've retro-fitted the system to my Mark I Auto-G.
Once the blades are spinning, increase motor power to start your take off run and let the autogyro accelerate along the ground. The main rotor blades will quickly get up to speed, and your autogyro will lift! The Durafly Auto-G does have a tendency to tip to the left as it lifts; I don't know whether this is a common trait of all rc autogyros, or whether it's caused by torque roll*. Being prepared with some right aileron does ease the situation, but it's still a hairy moment! *Although torque roll might be a contributing factor, my good friend John of rchelicopterfun.com explained that a likely cause is lift dissymmetry, whereby the advancing rotor blades (on the right hand side of the rotor disc) generate more lift than the retreating blades, until they get up to speed, thus rolling the Auto-G to the left. This makes perfect sense to me. Flying an rc autogyro is certainly a completely different experience. I've flown planes and CP helicopters, and my Auto-G is not like any of them - the maiden flight was certainly interesting! With my Auto-G, I found that I had to be hard with the controls - you need to show it who's boss, yet at the same time respect its flight characteristics. It's desire to climb (there's a lot of lift being generated, for not much weight) resulted in me having to apply down elevator trim almost to the limit - this was rectified back on the ground, by adjusting the elevator linkage accordingly. Once that was sorted, the Auto-G became a joy to fly; loops and stall turns are easily performed, and slow speed handling is as good as it gets. Landing is a breeze - with practice you can cut the power and let it float down to a spot landing, just carefully balancing elevator and roll to keep the approach path constant. An alternative to a take off is to hand launch an autogyro, but I have my reservations about doing this. If there is no wind blowing to get the rotor blades spinning, you'll need to run with it to get them turning - much like running with a kite on a windless day! Is an RC autogyro for beginners? If you've never flown a radio control aircraft of any kind before, my answer would be a definite no. Others may well disagree, but I just don't think an rc autogyro is for the beginner to the hobby - although they are relatively simple machines, they are not particularly forgiving in the air. If you have no prior experience, my recommendation would be to get confident with flying an rc plane or helicopter first, or both, and then you'll be fine with an autogyro. Once you have got confident enough to fly an autogyro, you'll have a lot of fun with one! The Durafly Auto-G has given me my first taste of flying an rc autogyro, and it's quickly become my favourite radio control aircraft of my collection - for the time being, at least! I had no idea what to expect, and Hobbyking's claims of "it's a completely different rc flying experience!" just sounded like more marketing hype to me. Oh how wrong I was, and how right they were! 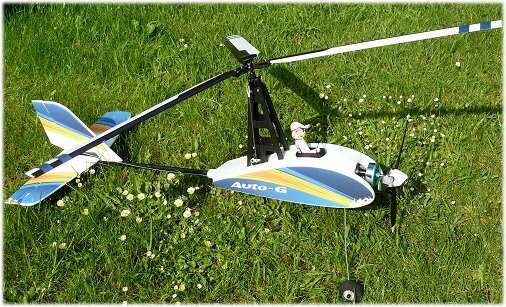 Flying a radio control autogyro like the Auto-G is a completely different experience, and I can give it a big thumbs up.